No player more epitomised the era of Vern Cotter than Greig Laidlaw, his Scotland captain. The little scrum-half does not have a break to speak of, does not tackle like a flanker or have a quicksilver pass. But he boasts a ferocious competitive spirit, a peerless rugby brain, superb goalkicking under pressure, great leadership qualities and an ability to wring the best out of those around him. In the Borderer's absence since breaking a leg - apart from his British and Irish Lions appearances, his last Test was captaining Scotland in Paris last year - Cotter has departed as head coach and Gregor Townsend has arrived. With Ali Price at half-back, results have been impressive: thanks to his great break and desire to play fast and loose, the youngster has looked the definitive Townsend player. Cardiff was Townsend and Price's first major speed bump, and it coincided with Laidlaw's return. He had played only a couple of games for his new club, Clermont Auvergne, and would probably have come on for the last 10 minutes if Scotland had been going well. Instead, he appeared after 48 minutes (eight minutes too late for most Scotland supporters) as the Scots tried to steady their sinking ship. His analysis of Scotland's shortcomings, and his prognosis for France at Murrayfield today, will strike a chord with Scotland supporters. coughing "We don't want to be frantic, we want to play disciplined rugby that is also quick rugby," he said. "We got away from that last weekend. When we start doing that, we start coughing up balls. Wales were able to live off our mistakes because we were trying to play fast all the time when maybe we were not set. We also need to be more pragmatic, play that Test-rugby mentality and back our defence." Ah, Scotland's defence. Against Wales, it was shambolic, as hesitant as against Samoa but with more devastating effects. "In our defence we were off the ball," said Laidlaw. "We were not excited enough to defend. We were maybe thinking too much about attacking." Part of Laidlaw's genius under Cotter was extracting the best from Finn Russell. 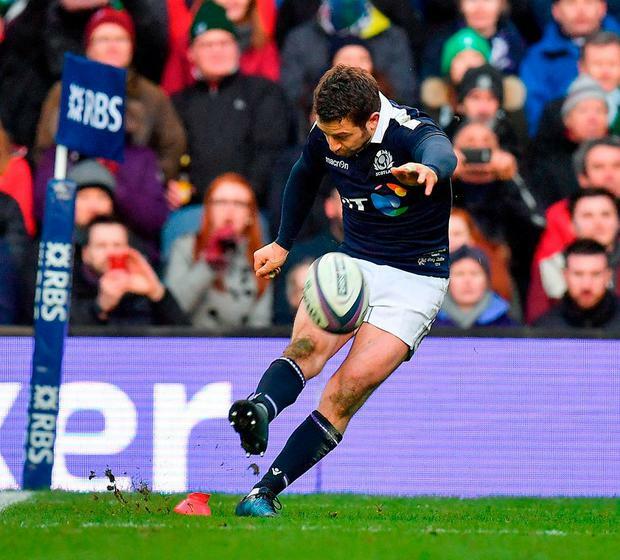 The stand-off can be a creative genius for Scotland, but against Wales his determination to attack no matter the circumstances proved a liability. With help from the experienced Peter Horne at inside centre, Laidlaw expects a more balanced game this time. And he says he feels rejuvenated after a much-needed rest, but it is his leadership and tactical acumen that Scotland need most. With captain John Barclay invariably at the bottom of rucks, the scrum-half will be arguably the key decision-maker. "As a collective we let each other down last weekend," he says, "but we have a Plan B." Scotland - S Hogg; T Seymour, H Jones, P Horne, S Maitland; F Russell, G Laidlaw; G Reid, S McInally, S Berghan, G Gilchrist, J Gray, J Barclay, H Watson, R Wilson. Reps: S Lawson, J Bhatti, J Welsh, B Toolis, D Denton, A Price, C Harris, B Kinghorn. France - G Palis ; T Thomas , R Lamerat, G Doumayrou, V Vakatawa ; L Beauxis, M Machenaud; J Poirot, G Guirado (C), R Slimani, A Iturria, S Vahaamahina, W Lauret , Y Camara, M Tauleigne. Reps: A Pelissie, E Ben Arous, C Gomes Sa, P Gabrillagues, L Picamoles, B Serin, A Belleau, B Fall. Joe Cokanasiga, the man "with the world at his feet", according to fellow wing Jonny May, takes to the Twickenham stage this afternoon intent not just on living up to that billing for the sake of his team-mates but also to press his case as the World Cup clock ticks down and the 'England's Got Talent' strapline is put to the test. James Corrigan Never mind 'Project Reset' or 'Project Inept' or whatever the warring factors are now calling the chaotic overhaul of Welsh rugby. Sam Peters A two-week build-up to Wales' potential Grand Slam decider with England was always going to be too long for Eddie Jones and Warren Gatland to both keep schtum.